Dental implants have become the gold standard in tooth replacement, but successful implant retained tooth replacement calls for help from a trusted, skilled dental professional. Before you choose a dentist or dental specialist, you need to make sure that they have the necessary qualifications to safely perform successful dental implant placement procedures. The easiest way to get all of the information you need about a dentist’s qualifications is to call to schedule a tooth replacement consultation. 1 – What is Your Training? This should be an easy question to answer. Most dentists display their degrees on the dental practice walls, but you should also ask specifically about advanced, hands on training and education specific to the placement and restoration of dental implants. You can also ask if your dentist maintains membership in any professional organizations with a focus on dental implants. These organizations typically require their members to keep up with continuing education each year. 2 – How Long Have You Been Placing Implants? If your dentist has an adequate amount of training in dental implant placement, the obvious next question is how long they’ve been offering the service. 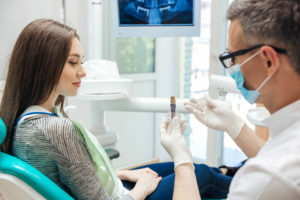 While a skilled dentist will provide effective implant placement with proper training, the longer dentists perform these treatments, the more experienced they are and prepared to take action if complications arise. You can also ask your dentist about the total number of dental implants they’ve placed in their career. 3 – How Often do You Place Implants? Similarly, you should ask your dentist how often he or she places implant posts. Some dentists place one or two implants each year while others can perform one or two implant placements a week. Again, these professionals have more experience and may be better able to handle concerns during dental implant placements. 4 – Can I see Some Before and After Images of Your Patients? You may be able to find before and after images of your dentist’s patients online. Many providers include dental implant restorations in their smile galleries. Most other dentists keep before and after photos of their successful cases even if they don’t publish them online, so ask to view these images during your consultation. At the San Marcos and Rancho Bernardo dental offices of Nelson Y. Howard, DDS, we are proud to offer the full dental implant tooth replacement process. Dr. Howard has years of advanced education, training, and experience that makes him the go-to dental expert for implant placement and restoration. If you’re missing a single tooth or complete row of teeth, we invite you to contact Dr. Howard to find out more or schedule your tooth replacement consultation in our San Marcos or Racncho Bernardo dentistry practices.